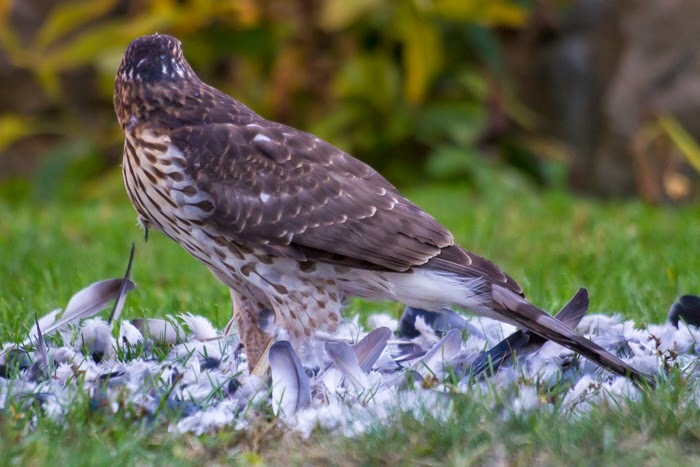 So this is the story of how I recently went from IDing a Cooper's Hawk to a Northern Goshawk, and then eventually back to Cooper's Hawk again, and slightly embarrassed myself on social media along the way. I think it is a useful tale to tell, both in learning how to ID juvenile Accipiters, but also in being cautious and humble about our bird IDs, no matter what our level of mastery. In fact, if you're a veritable Roger Tory Peterson, not only have you undoubtedly made a misidentification at some point, your frequency of birding, combined with your confidence and knowledge, probably guarantees that you've made more than few, some (or many) you probably don't even realize, because there was nobody there to question your ID, or there wasn't a better look at the bird, or a photograph to pour over in detail. This past Saturday I went for a walk with my family around Tarrytown, NY. This was the scene in our neighbors backyard (right next to our driveway) when we got back. 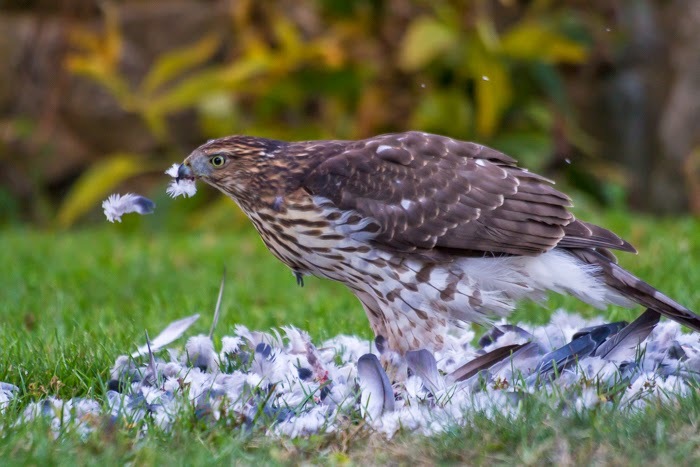 A large Accipiter had nailed a pigeon and was eating it on the neighbors lawn. 1. Size. This bird seemed huge for an Accipiter and broad-chested too, probably the biggest Cooper's Hawk I've seen. It seemed more like a Red-tailed Hawk in size and chest breadth. It's size was the first characteristic that started me thinking Goshawk. But there are a couple of issues with using size in ID. First, it is hard to judge, particularly when there isn't another bird nearby to compare to. And although I used to band hawks, it's been a while and I'm out of practice judging relative size. Second there is a lot of overlap in size (especially in closely related species), such that individuals at the extremes may actually overlap or come close to it. 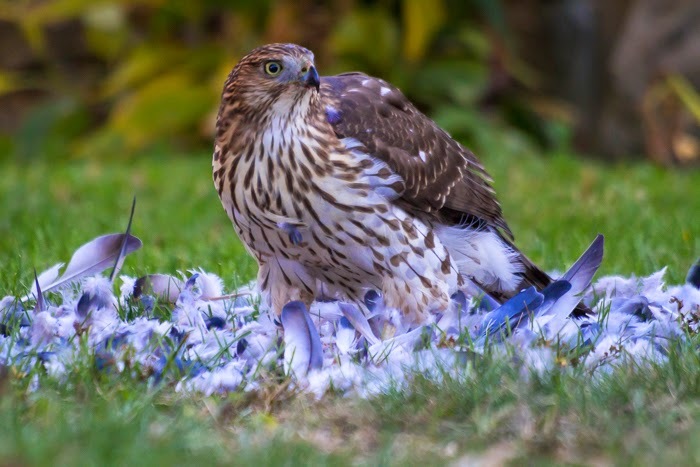 For example a large female Cooper's Hawk can be 47 cm in length and up to 678 g in weight. A small Red-tailed Hawk might be 45 cm in length and 710 g. So a large Cooper's Hawk could overlap somewhat in size with a Red-tailed Hawk. 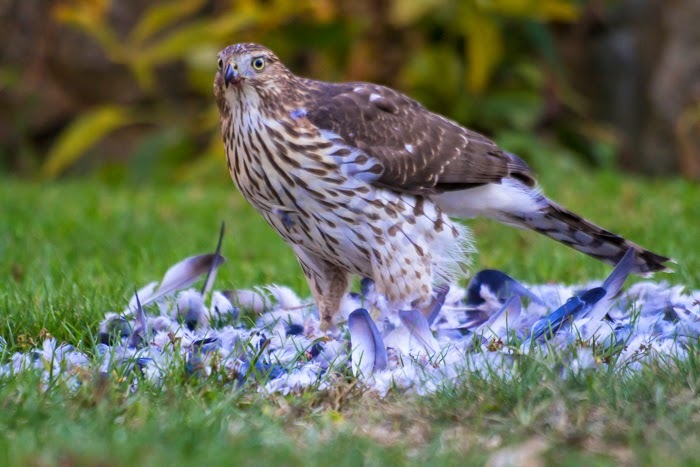 More importantly, a small male Goshawk might be 46 cm in length and weigh 677 g. So size, while helpful, is certainly not definitive and can be misleading. 2. Superciliary Line (eyebrow stripe). This individual clearly has a pale superciliary line right? It may not be broad or highly distinct from the rest of the head plumage, but it is there. Well what if I showed you the other side of this hawks head? Still a clear, distinct superciliary line? And, it turns out that immature Cooper's Hawks can have pale superciliary lines as well, it is not a diagnostic character in and of itself. 3. Heavy streaking on breast. In this case this individual does have heavy streaking on the breast and that streaking extends well down between the legs and onto the legs and is still relatively heavy. It also happens that this individual has a relatively buffy wash to the breast (vs. white) which is a characteristic more common to Goshawks, but it is important to note that these plumage characteristics can vary quite a bit, both within Cooper's Hawks and Goshawks. This is a good caveat to remember for plumage characteristics (particularly the strength and extent of streaking, striping, or barring) in many similar looking species where ID is challenging. 4. Streaks on undertail coverts. In the two images above, it looks like a few streaks extend onto the undertail covert feathers. Certainly not very heavy, or extensive, but maybe this is just an aberrant individual (as we said in #3 plumage characteristics can be variable). 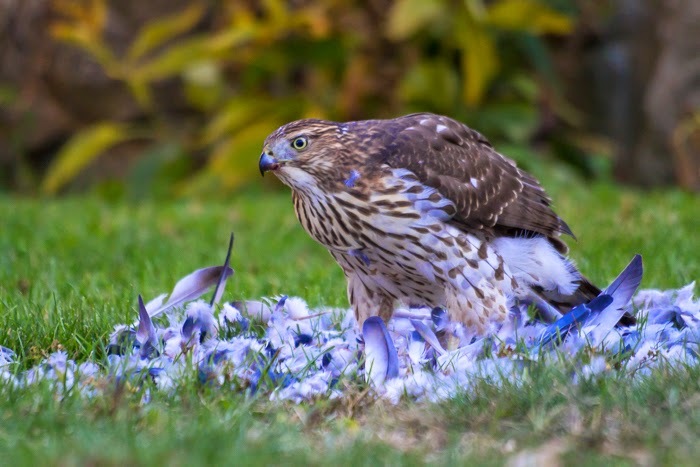 Well take a look at this image of the hawk lifting its tail. It turns out the those streaks came from stray overlapping feathers from around the legs, the undertail coverts are pure white, and this is a fairly key diagnostic feature for Cooper's Hawk vs. Northern Goshawk (although the undertail coverts are clear in some immature Goshawks according to the Clark and Wheeler Peterson Hawk Guide). 5. Uneven bars on tail. This was a key character that led me astray. The dark bars on the upper side of the tail of this individual were uneven. I never got a perfect look at the tail through the binoculars, and even less so through the camera, but those bars were definitely uneven and interrupted as they moved towards the center of the tail. However, it is possible that this individual was missing a tail feather contributing to the unevenness. One thing that bothered me though was that although those dark bars seemed uneven, there didn't seem to be any lighter outlines on the outside of the dark bars, which is fairly diagnostic in Goshawks seen up close like this one was. Here is one of the best images I got of the tail. Though you can't see the uneven bars very well, you can definitely see the lack of a light border as the light bars transition into dark ones. 6. Mottled back feathers. This is one trait that always bothered me about this bird and set off alarm bells from the start. Although this bird has a few stray white spots and some buff outlines to its wing feathers (common in immature birds), it doesn't have anywhere near the mottled appearance that I'd expect in a Northern Goshawk. The back and wings looks like the plumage of a typical immature Sharp-shinned or Cooper's Hawk. So given all this, and despite what I rashly posted to my personal Facebook page while I was still observing this bird, I'm going to pretty confidently state that this is an immature female Cooper's Hawk (and no less beautiful or enjoyable for being so). I guess the take-home messages here are not to ignore those nagging doubts when making an ID, to take some time and make sure of your confidence before going public with an ID, and to approach bird ID with a little humility. Remember that no matter how good you are, birds can be variable and you are inevitably going to make a mistake, whether you know it (or admit it) or not. Thanks for reading through this relatively long post, especially those who aren't that chuffed about the intricacies of raptor ID. As a reward, here is an extra behavior shot of this great bird. P.S. My wife was waiting on me to go to the grocery store to get ingredients for something she was making, so I didn't have time to grab my tripod out of the car and go about this the way I usually do, so all these images were handheld at ISO 1600. Not normal for me and not quite the quality I usually demand, but fine for illustrating the point. And yes, the "tail" in the title was a pun and reference to point #5 in the article, not a spelling error or word confusion. do you see this when your hiking?or your back yard? or in parking lot? In my neighbor's backyard, just off my driveway.